Alice’s practice in landscape involves temporary installations which provoke an awareness in the viewer of their own presence within the setting. 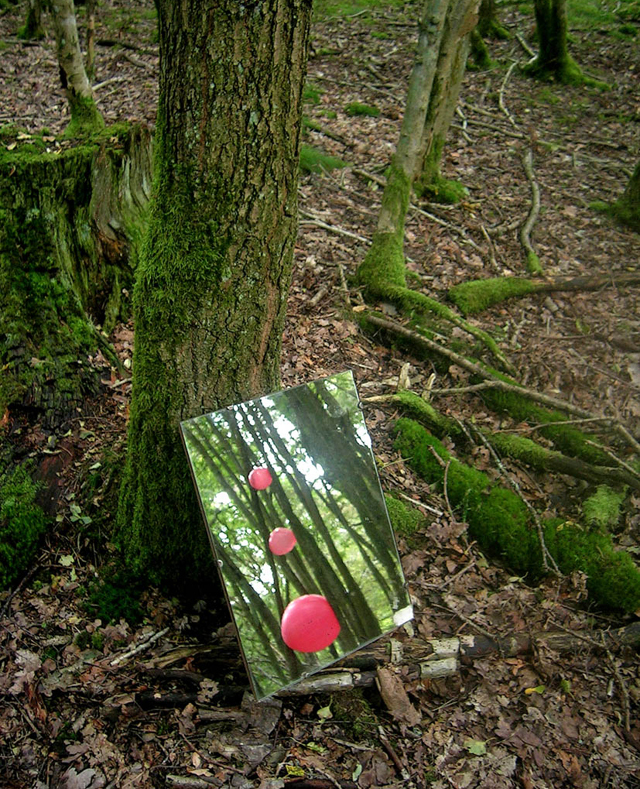 Often using visual play on 2D and 3D space, she invites us to explore our spatial awareness and how we perceive and relate to landscape.In this experimental work for Heartwood Alice uses mirror and miscellaneous materials to draw the viewer in, to witness, perhaps surprising, aspects of and interventions in the woods. Alice Betts graduated in glass from Edinburgh College of Art in 1999 and is based at Edinburgh Sculpture Workshop. 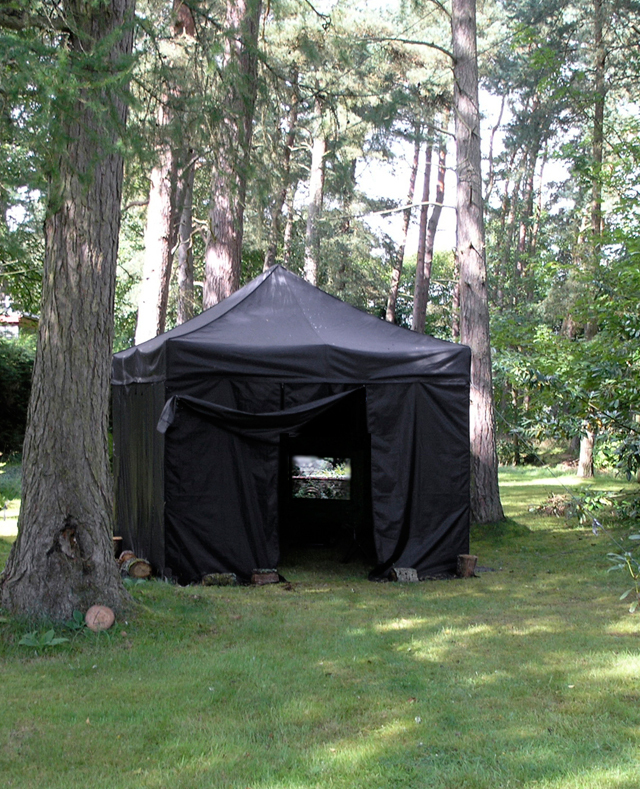 Her creative practice in landscape has developed through temporary public commissions and residencies. Awards include a Scottish Arts Council Creative Development Award in 2000, the Benno Schotz Award and more recently the Cairn Energy Prize for a new video work in 2011. She has taught for two years at North Wales School of Art & Design and at Gray’s School of Art. Kyra Clegg and Su Grierson each make videos within their wider art practice. The program shown here highlights subject matter from their individual practices relating to the natural environment. Kyra Clegg’s ‘Mirror Mirror’ was inspired by Walter Rothschild’s book ‘Extinct Birds’ published in 1907. Su Grierson’s ‘Pathways’ was created during a residency at Château de Padiès in France. 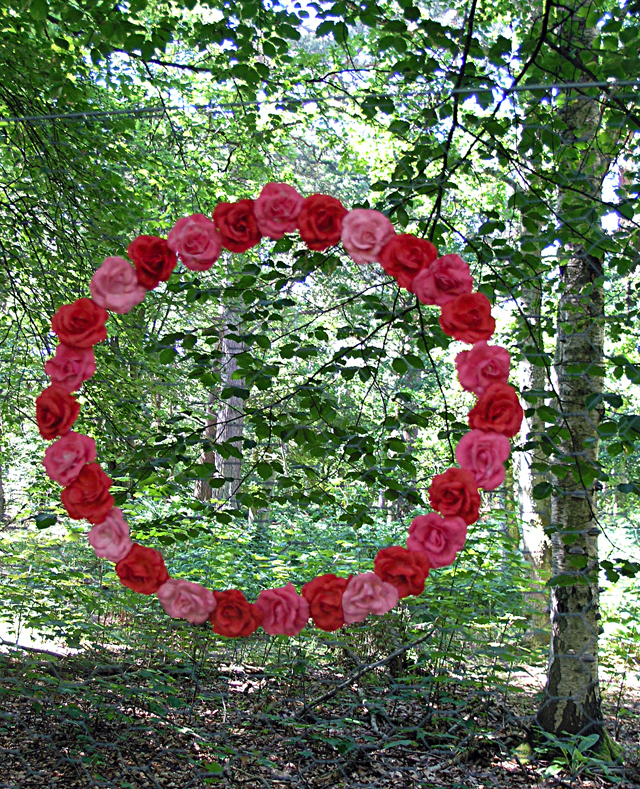 In 2009 they took part in a video project ‘Opposing Eden’ in which they joined Estonian artists Liina Siib and Laura Kuusk creating experimental collaborative performance work within the landscape in Scotland and Estonia. Sharing all the footage, images and sound works of this period the artists then edited their own individual works. ‘Shreds’ and ‘Countdown’ are outcomes from this project. Both artists have an ongoing interest in experimenting with the visual and technical elements offered by the digital media, breaking the picture plane and inserting text and objects within the moving image as ways of extending the visual experience and narrative content of the work. 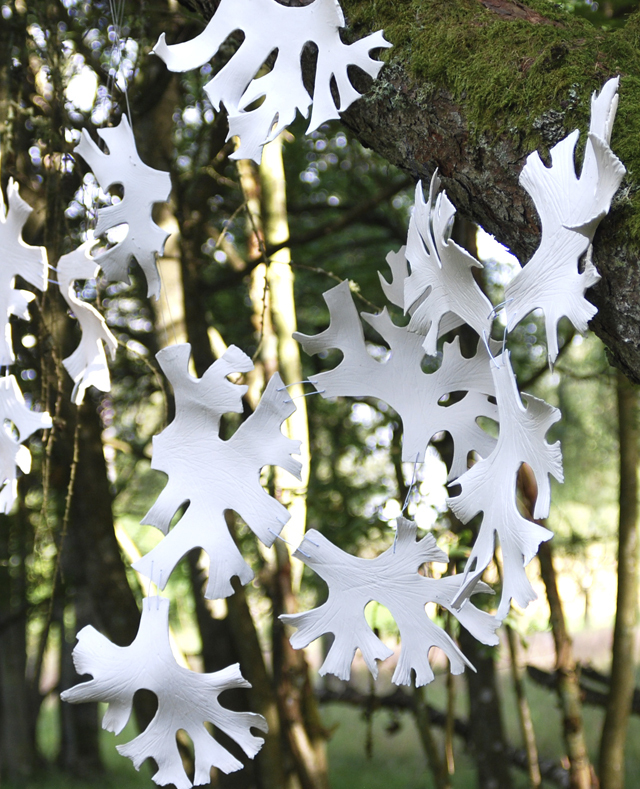 As part of Fanny Lam Christie’s on-going exploration of the Monkquell woods, her new work ‘Blanket ’ highlights the lichen thriving on the many tree branches within the woods.The work is based on a particular species of lichen, Evernia prunastri, which is used as an important index for measuring clean air as it is very sensitive to air pollution. Evernia prunastri does not survive in habitats where the air contains a certain level of sulphur dioxide and as such, is never found in city areas.‘Blanket’ also celebrates 2011 as the International Year of Forests, testament to the importance of the forest environment within our global ecosystem. Fanny Lam Christie’s work explores the relationship between human intervention and nature. An environmental concern is often an underlying theme. Her sculpture ‘Storm’, reflecting the vulnerability to climate change, won an award in the 180th RSA exhibition. Fanny undertakes both public art and independent projects and takes part in exhibitions regularly. She is a graduate of Edinburgh College of Art and based in Perthshire. Border can be a prohibition – a demarcation – a line in the sand which says ‘thus far and no further’. Or it can be a decoration – a floral fringe – something to charm the eye and soften the jagged over-tones of its other meaning. For it is a liminal word and flexible as to its interpretation. Its semantic fluidity serves to undermine its jagged and barbed context as something fixed – we can draw the line but the sands will shift. 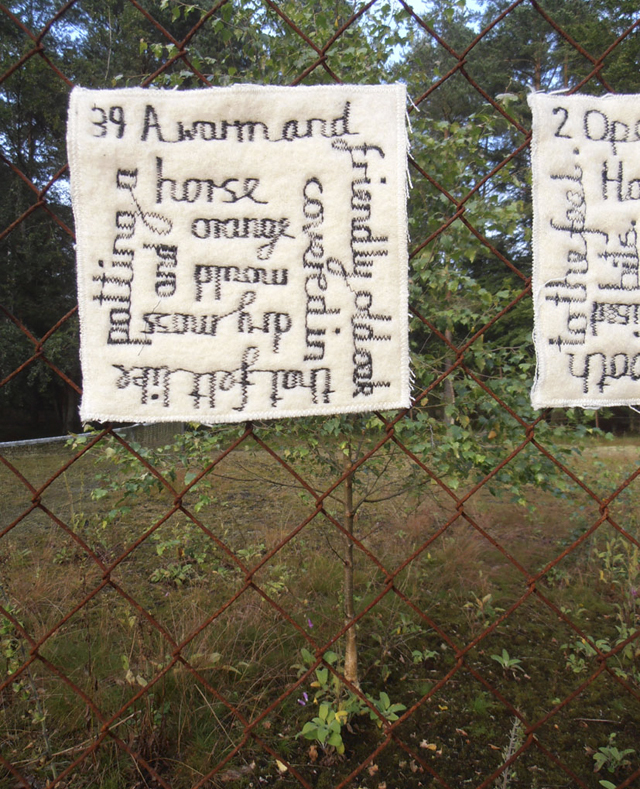 Using this duality Kyra Clegg’s work spells out in flowers the words Border Control on the fence which separates Heartwood’s garden wood from the wild wood. A graduate of Fine Art Kyra Clegg works in various media including sculpture, video, collage and photography, exhibiting in Scotland and abroad. In domestic life we adorn our homes and selves with images derived from the natural world. It seems that these symbolic images, when made safe by their removal from reality, create a sense of wellbeing, security and order. ‘Comfort Zone’ draws attention to this practice by creating an intense installation, within the Heartwood tennis hut, that utilises design images of natural plant and animal pattern on domestic and utilitarian objects as well as personal dress. 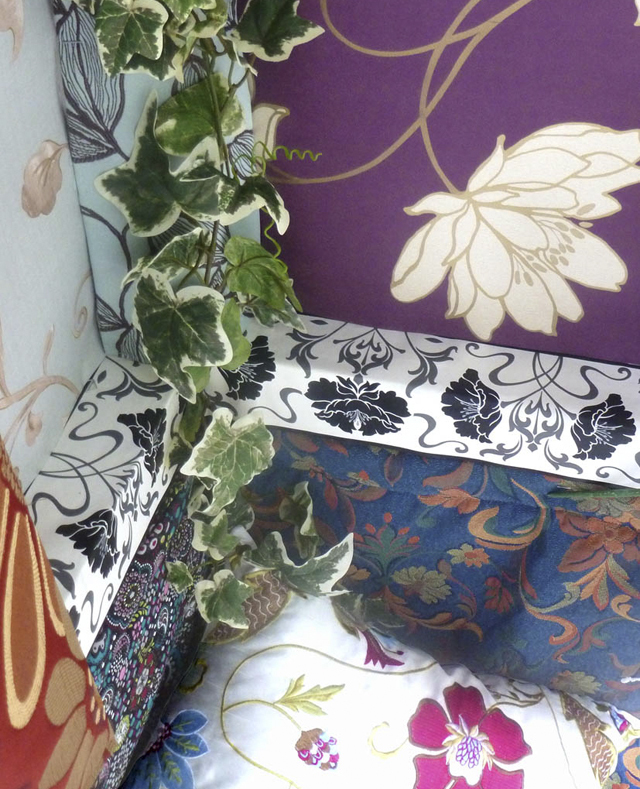 The work creates a woodland ‘oasis’ or verdant ‘jungle’ room, a total overload of symbolic nature. Anita’s work focuses on the preservation of memories, which are expressed in individual or repetitive groups of constructed, tactile textile pieces, drawn with fabric and thread, and incorporating traditional craft and needlework techniques. She likes to walk and explore the beaches and footpaths in Scotland, keeping diaries and collecting material and objects along the way, to gain inspiration for new work. 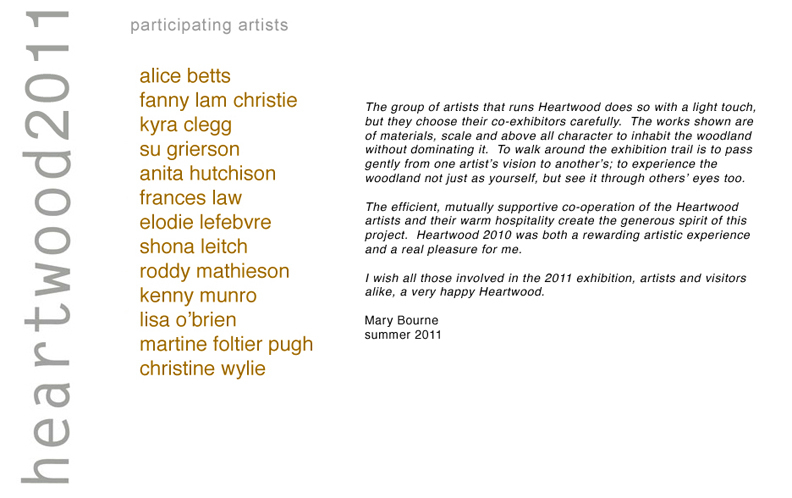 Heartwood’s surface was researched by touching, taking rubbings and notes. The descriptive words written on the rubbings became more important than the patterns made by the uneven surfaces, and here have been used to create a series of stitched textiles to record and preserve the experience of walking around the paths in the wood. The importance, recollection and communication of memories have become predominant in her work after watching and caring for a relative with dementia. Anita purposefully creates and then preserves her experiences using tactile textiles as an ‘aide-mémoire’ to prompt the memories. Anita attained a Master of Design degree at Duncan of Jordanstone in 2005, after a BDes (Hons) degree in textile design in 2004. During the Master’s degree she investigated the use of tactile materials as a catalyst, in the form of textile crafts, to improve communication with the elderly and people with dementia. Artists place high value on drawings and sketches. They form part of a process which constantly inhabits the artist’s mind. Instead of fixing the flow of imagination, drawing keeps the mind in flux creating a sense of limbo; a conceptual space where ideas can develop. 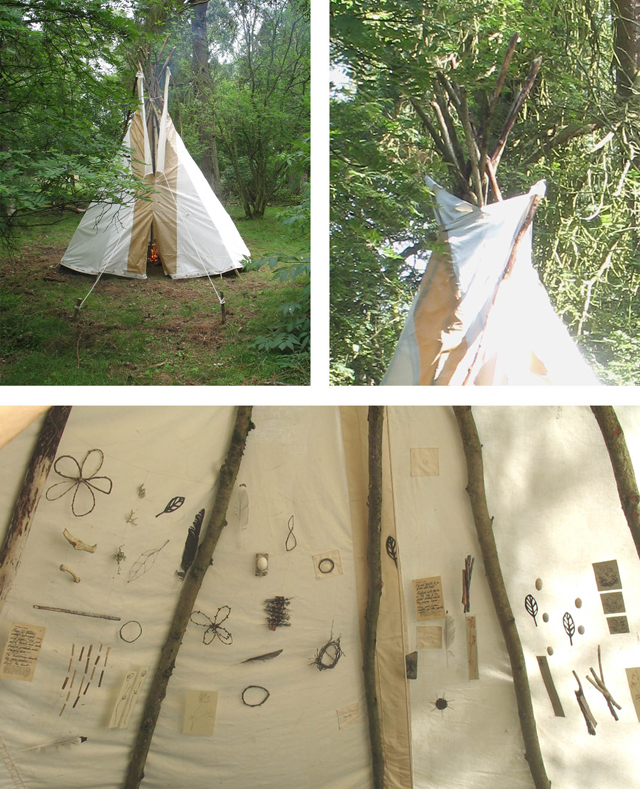 In her handmade tepee studio, Frances Law has created a 3 dimensional sketchbook of ideas. Working on site, observing and collecting material from the woodland around her and drawing on archaeology and on her own memories, she presents her findings. These refer to a world not yet discovered, nor yet understood; tantalising our curiosity and feeding our imagination. ‘Outside In’ forms a primary means of expression, a direct form of communication exposing the magical and secret world that is the mind of the artist. Frances Law was born in Central Region and is a Fine Art graduate from Glasgow School of Art. She is a painter and mixed media artist who also works with installation and is based in rural Angus. Her work has been shown extensively in many group and solo exhibitions in the UK and internationally. Frances has won numerous awards and her work is held in both public and private collections at home and abroad. It is a Japanese tradition that when an object is broken, the missing piece is restored with golden leaf and sometimes even replaced in gold. This is an interesting philosophical way of dealing with the notion of unity and void, choosing the most valuable matter – gold – to fill holes in broken objects. 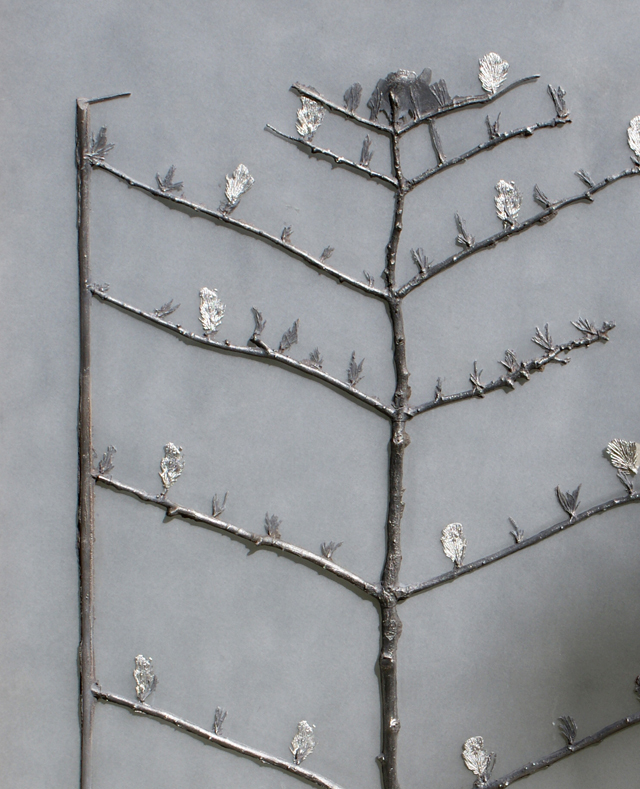 Elodie Lefebvre’s work takes this Japanese tradition and transfers it to natural surroundings where all things are living, constantly transforming and recomposing. She works with both natural fractures as well as man made cuts in fallen wood, which she ‘restores’ with gold or copper leaf. The ‘Ogon – no – ki’ project is strongly linked to the territory where it is set. Walking the woods is just as important as the making of the piece, as it is her own perception of the territory and of its energy that determines the specificity of the final work. 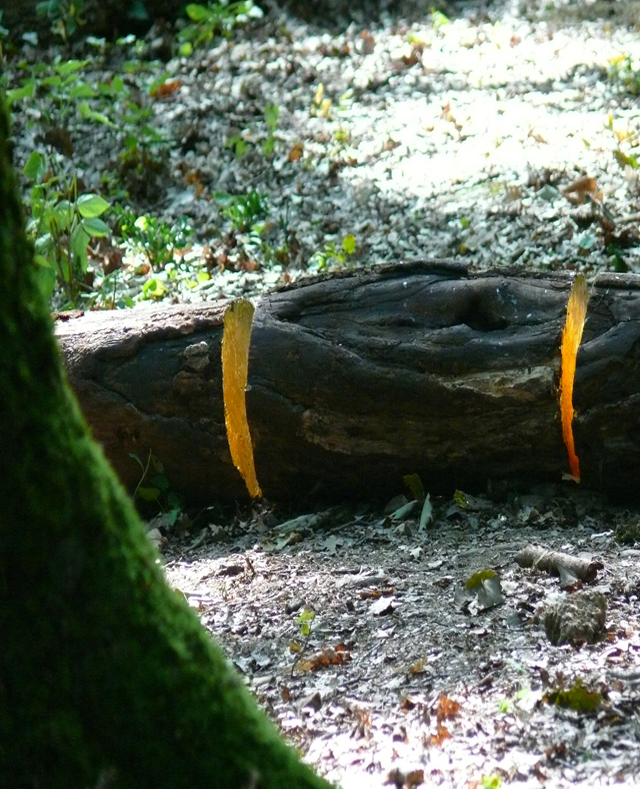 Elodie Lefebvre began researching the ‘Ogon – no – ki’ project during a residency in the organic and wild gardens at the Château de Padiès in France in 2010. Elodie Lefebvre lives and works in Toulouse. She trained in Fine Art in Toulouse and undertook postgraduate study at The Kent Institute of Art & Design in Canterbury, England in 1997. She exhibits in the south of France, and in the festival of contemporary art ‘Carne’ in Paris. She has undertaken various residencies in France. A natural progression from last year’s installation, ‘Hangin’ On’ depicts extremes of existence and the nature of balance by inviting the viewer to explore equilibrium and the variables within the cycle of personal circumstance. Perception informs direction – this work offers the viewer an opportunity to examine the possibilities of being. In contrast to the natural setting of mixed woodland at Heartwood, ‘Fake Fir’ looks at the process of environmental packaging, as in the way landscape is marketed to us. This has become a cultural norm to the point where commercial (forestry) plantations have become visitor attractions where we can park, relax, and enjoy the (human) nature…without realising just how artificial the surroundings are. With realistic forms moulded direct from nature ‘Fake Fir’ offers the viewer all the beauty of a real tree captured in solid tin for a more permanent and low maintenance experience, without the unpredictable inconveniences that nature brings such as: weather, insect infestation, and animal excrement. Enjoy it like the real thing, even more than just a tree – ‘Fake Fir’ is a work of art. The cast is exhibited surrounded by its making process, the pattern board, mould box, charcoal and sand, elements referencing the processes of manipulation. 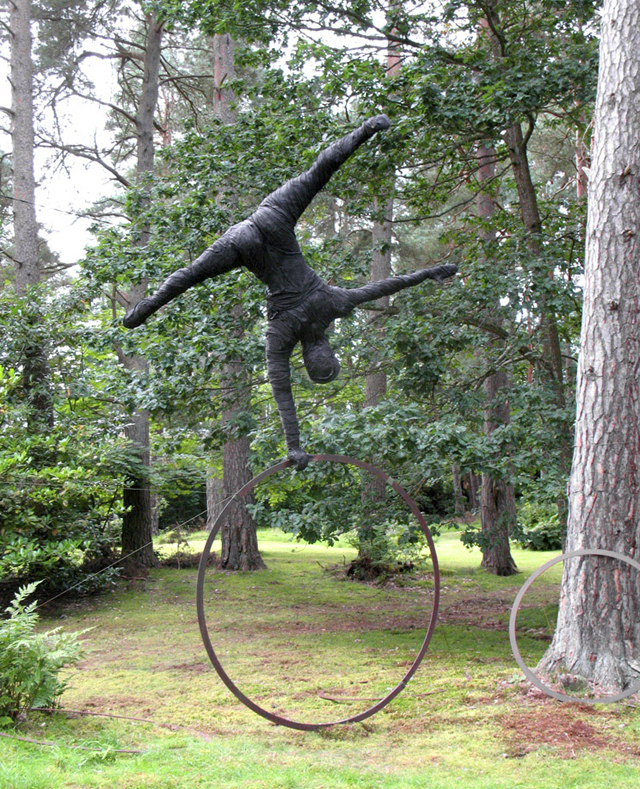 Roddy Mathieson graduated in Sculpture from Duncan of Jordanstone and works predominantly with metal casting processes. For this he has established his own foundry, The Mobile Foundry, delivering public art projects around the country. Recent works include commissions with Dundee City Council (Hilltown Park), The Roanheads Public Art Project in Peterhead with Jason Nelson, and he is currently working on the ´Fusions´ project with Invergordon Off The Wall. Munro’s work over the last decade has taken him to India several times where an artist exchange was established. As part if this project, a 5 metre Bengal Boat was commissioned near Kolkata, brought to Scotland, and used as an icon to celebrate cultural links in both countries, giving particular focus to the connection between the rivers Tay and Ganges.‘Rivers & Trees of SCOTLAND AND INDIA Meet’ highlights the friendship between the ecologist Sir Patrick Geddes and poet Rabindranath Tagore and commemorates this year’s 150th anniversary of the birth of Nobel Laureate Tagore. 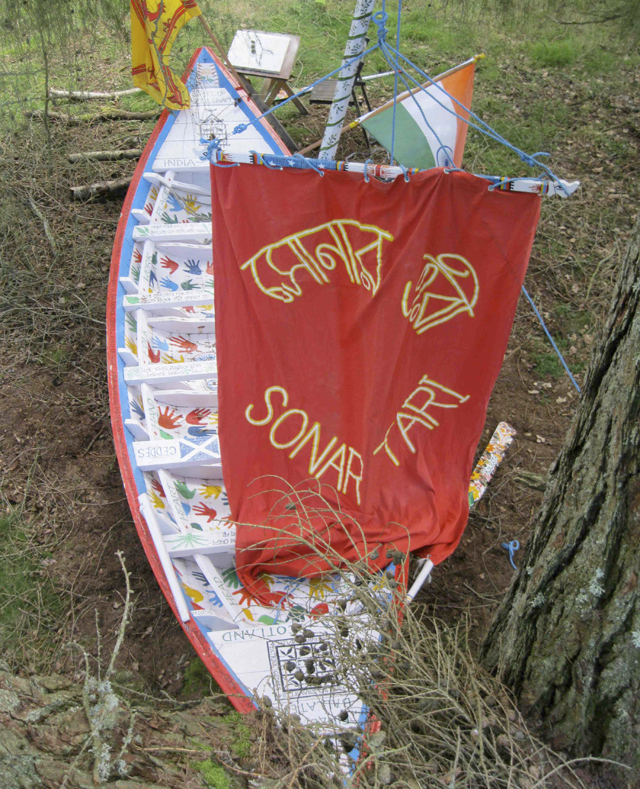 The boat is painted with the Tagore poem Golden Boat (Sonar Tari) and images relating to environmental themes by students from a small school in Kolkata where Munro worked. During its exhibition at Heartwood, local schools have been invited to come and engage with the whole show as well as with the Bengal Boat. Edinburgh-born Munro graduated in Sculpture from Edinburgh College of Art. He then went on to study at Oslo University and the Royal College of Art in London. Through his sculpture, film and writing, Munro has established an international reputation as a communicator and educator, often working in collaboration with other artists. His work has been exhibited in many diverse locations around the world and can also be seen at the National Museum of Scotland in Edinburgh. Lisa O’Brien’s practice explores how we experience being in a particular place at a particular time, she sees this as related to duration and how we experience time passing and very much related to memory. What traces do we retain of a particular day, place, activity or object? How do we re-experience them in our memory? Our perception of real time is subjective and our recollection of events collapses real time into a concentrated shifting essence of the original happening. 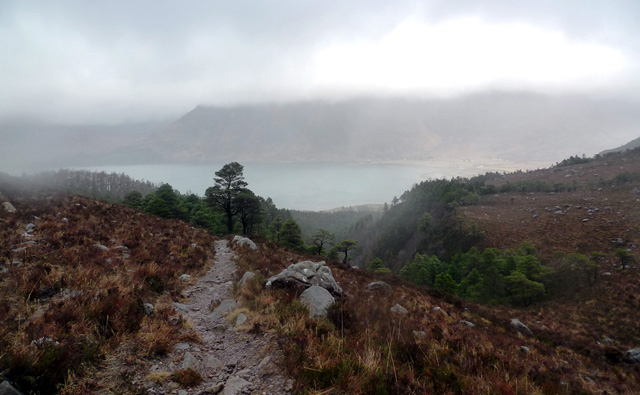 “Climbing up the mountain for forty minutes I was surrounded by a dense forest of mainly Scots pines, hundreds of years old, 60-70 feet high and the strong wind roaring through them. On reaching the tree line there was a dramatic change in the landscape, as there were just a few metres of smaller trees before there was virtually no protection from the elements in wide open heath land. Being buffeted from side to side by gale force winds I walked for a further 45 minutes until I found a small sapling clinging to a rock in a ravine about 30 feet deep. The mountain peak above faded in and out of view as rain clouds blew by. It was from here, at about 1200 feet above sea level, that I uprooted the rowan”. Lisa O’Brien completed the Visual and Performing Arts course at Brighton Polytechnic in 1989 and a Master in Fine Art at Gray’s School of Art 2007. Her practice includes sound, video, installation and mixed media 2D work. She exhibits nationally and internationally and was selected for Axis Open frequency, New developments in contemporary art in 2005. The installation reveals itself gradually as the visitor progresses along the path. 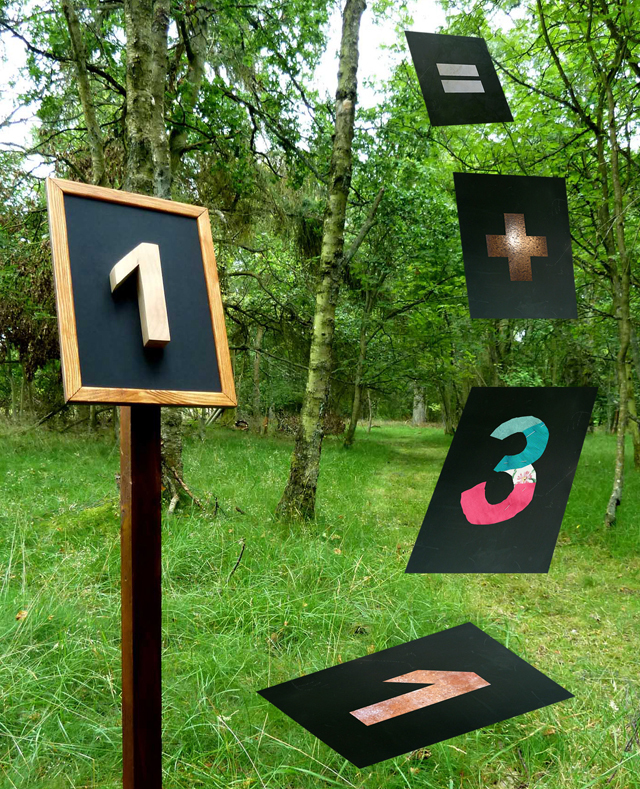 The numerical puzzle conceals a multi-layered narrative. All the signs and numbers were created from time-honoured materials which required specialist advice and assistance from others for their process – hard wood and marble cutting, clay firing, bronze casting – except for the last which was made with mixed media, Martine’s preferred practice. What purpose do such challenges serve? One of the answers can be found in the outcome of the riddle, that together the parts produce a result greater than their sum and illustrate the synergy which is at the heart of collaborative projects. After graduating with BA Hons in Sculpture from Edinburgh College of Art, Martine Foltier Pugh went on to complete an MA in Contemporary Art Theory and in 2011 graduated with an MPhil in Visual Studies; her dissertation explored the topics of collaboration and participation through a narrative based on a fictitious residency project set in rural Scotland. Over the last seven years she has received a number of awards during her studies and one from the Scottish Arts Council to install work in the garden of the Hill of Tarvit mansion house in Fife. The colour and shape of rapeseed fields that punctuate the landscape in spring and early summer has inspired this new work, installed beneath the canopy of a large beech tree. At Monkquell, the natural woodland is bordered by farmland. The flatness, openness, and shape of the fields are in complete contrast to the verticality and intimacy of the woodland. They appear to represent (agri)culture at odds with nature. 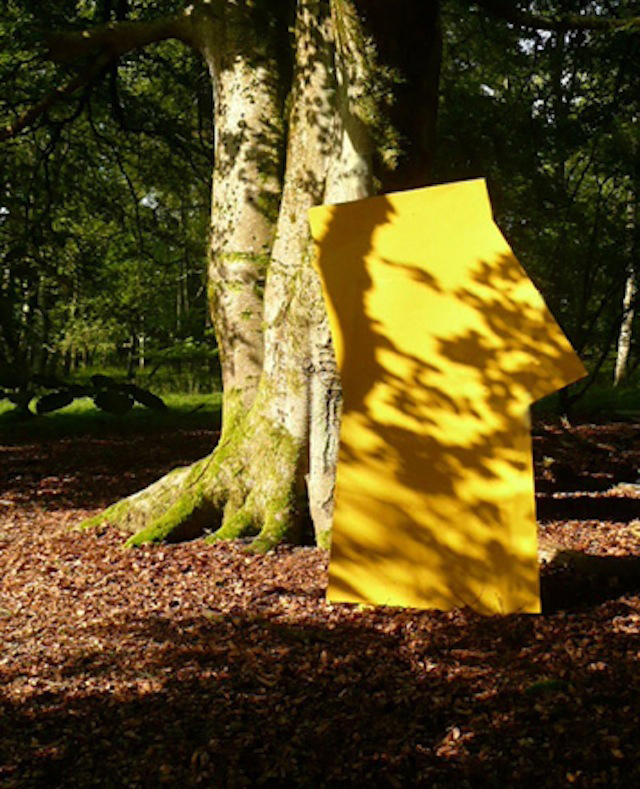 Painted bright yellow, the single sheet of aluminium cut in the shape of a field adjacent to the woodland, leans against the tree. Walking through the woodland, the large block of colour catches the eye, diminishes to a single line, only to be caught in sight again. Colour field. With degrees in English Literature, Drawing and Painting, and an MFA in Art, Space and Nature from Edinburgh College of Art, Christine Wylie has exhibited widely in the UK and Europe, and also in America. Her site-specific works are often combined with literature. In this case the title of the work is from the Chinese poet, LuYe.